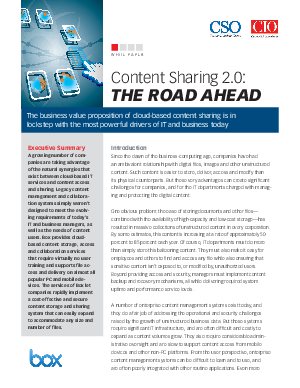 A growing number of companies are taking advantage of the natural synergies that exist between cloud-based IT services and content access and sharing. Legacy content management and collaboration systems simply weren't designed to meet the evolving requirements of today's IT and business managers, as well as the needs of content users. Box provides cloud-based content storage, access and collaboration services that require virtually no user training and supports file access and delivery on almost all popular PC and mobile devices. Read how Box let companies rapidly implement a cost-effective and secure content storage and sharing system that can easily expand to accommodate any size and number of files.